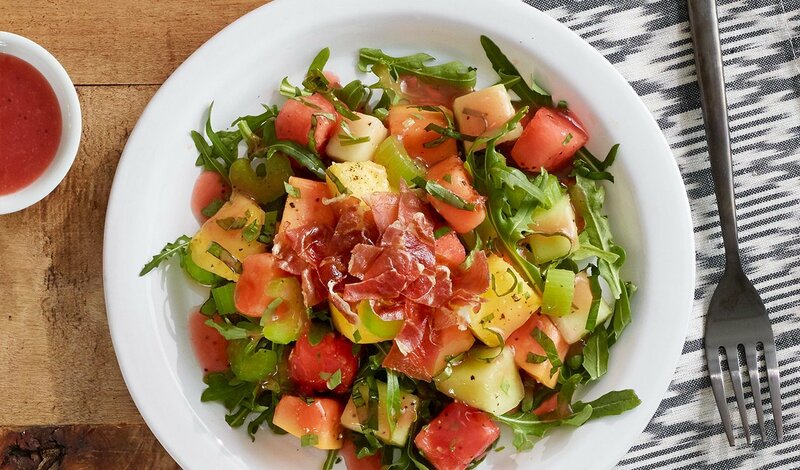 A colorful summer salad of diced melon and arugula tossed in Hellmann’s® Light Raspberry Vinaigrette. Topped with crispy prosciutto for a salty crunch. Combine half of the Hellmann’s® Light Raspberry Vinaigrette Dressing with arugula and mix until the greens are coated. Combine fruit, celery, herbs, black pepper, and remaining Hellmann’s® Light Raspberry Vinaigrette Dressing and mix until well coated. Top the mixed arugula greens with the fruit salad. Garnish with prosciutto and serve.